We are posting this today at 3pm because two years ago today, July 16, 2013, at 3pm, Fr. Paul Gofigan's life was destroyed with this letter....or so they thought. They didn't expect Fr. Paul to stand up to them. They thought he would slink off into the gutter where lay the lives of the other priests destroyed by Apuron and his cowards. But Fr. Paul did fight back. And he is still fighting. And as we all know, the fight has grown much bigger than just his case. This has become a battle against a cancerous abomination. And it will continue. Apuron's infamous "painful and arduous" letter should make interesting reading two years hence since we now know that NONE of what Apuron accuses Fr. 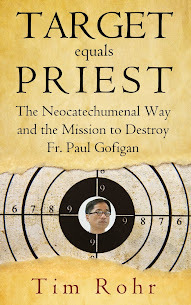 Paul of is true - and especially since we now know that Apuron himself permitted "Mr. Lastimoza" to work at the parish in the exact same capacity thirteen years earlier. The best revenge is to donate funds to Fr. Gofigan for the expenses he needs to pay to his canon lawyer. Cowards like me cannot come forward in public but I can and do contribute to Fr. Gofigan's and Msgr. Benavente for their canon lawyer defenses regularly. The parable of the Good Shepherd and the lost sheep is a parable I will always think of when you refer to Father Paul. A Shepherd, he is indeed. Thank you Father Paul for giving people a chance when no one will do so. It is worth noting that if they didn't make the mistake of doing that injustice to Fr. Paul, the cancer that is the Neo, would have not surfaced. I remember you said that you didn't care what they were doing and only cared after the injustice to Fr. Paul. God works truly in mysterious ways. St. John Vianney, Patron of all priests. Help our Lady's Beloved Sons on Guam! Amen. Father Paul we continue to pray for you. The last sentence says it all...why we are all in this fight together. 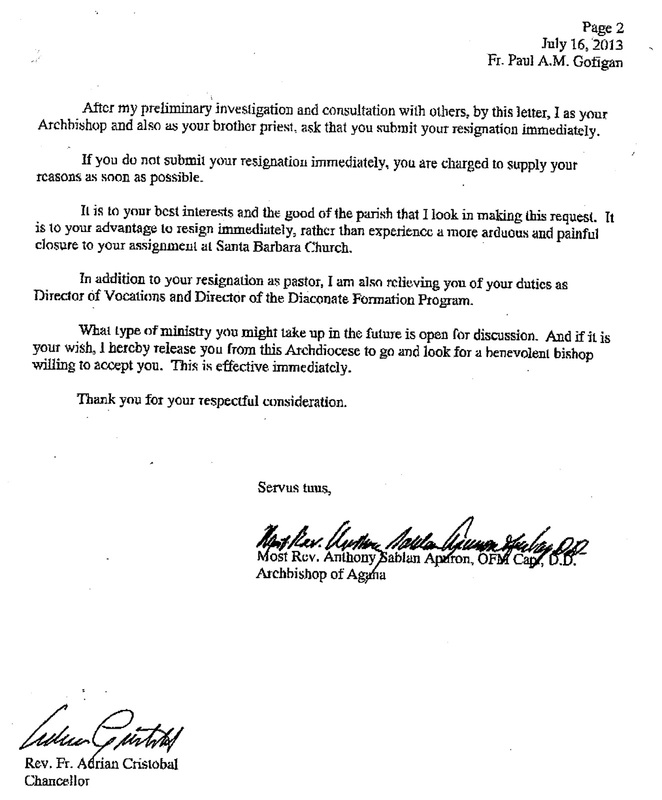 Tony says: "I hereby release you from this Archdiocese to go and look for a benevolent bishop willing to accept you." AND THAT IS A HOLY MAN! Tony put his foot in his mouth yet again, but he also unwillingly foretold his own future. After all, we are all looking for a more benevolent bishop, since Guam has none. So for 2 years we have tried to bring our bishop back to benevolence, and he has failed to answer the call. He has lied repeatedly to us, and he has even lied to Rome. He has stolen $40 Million from our Archdiocese. He has willfully ruined lives. And he cries to us publicly that we are treating him poorly. Tough KAKA! 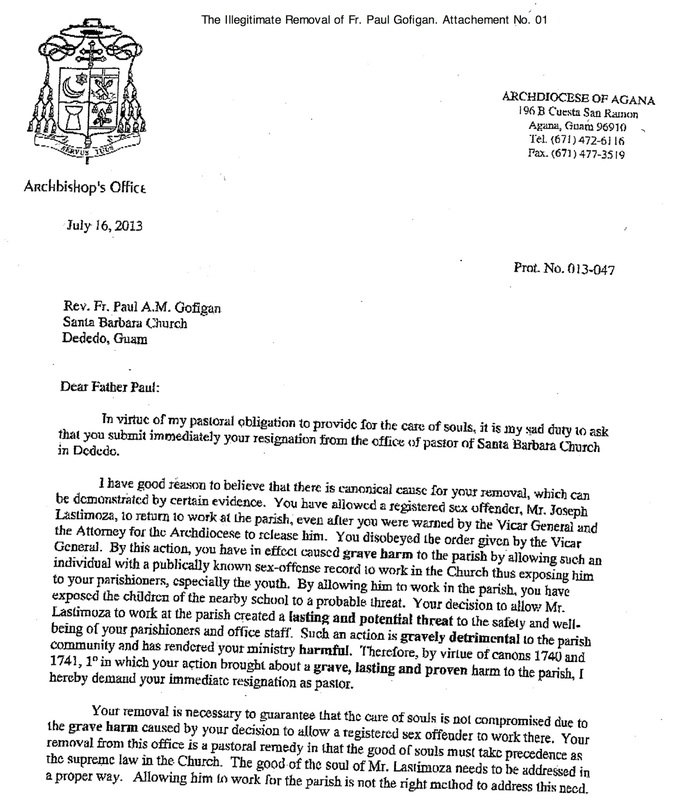 "I hereby release you from this Archdiocese to go and look for a benevolent community willing to accept you." We no longer have any need for you whatsoever, and we will continue to wait for Rome to finally see the reality of the evil that has consumed you. Happy Liberation Day! You are released! Dear Archbishop, An anniversary date is usually a time to contemplate the occasion. 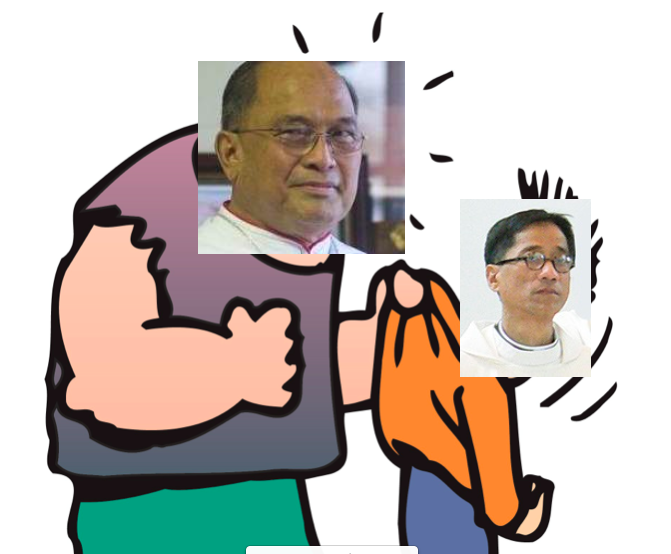 The actions that you took to unceremoniously remove Father Paul and a year later Monsignor Benavente has resulted in a fire that engulfed the entire Archdiocese. Father Paul stood up to the "tall Lady" and her cohorts were a major cause for his removal. Two years later Monsignor James suffered the same fate, he was accused of misdeeds, without the benefit of due process and he and his family are still carrying this burden. You became the accuser, judge and jury. Without giving him the chance to face his accusers. Archbishop, although the pain, anguish and emotions could not be erased, I think that if you were to do the right thing and restore these two wonderful disciples of Jesus back to their former status it would be your expression that you are making a strong effort towards healing this fractured Church. I think that dialogue can then being to explore ways to find ways to co-exist. I can assure you that no one enjoys the situation that we find ourselves in. You, Archbishop is the only one who can begin the healing process. I think that by restoring the two clerics to their former positions will be strong signal on your part that you too, want to end the strive and begin to address the issues that have cause this divide. Everything is in your court. It is now your move… Please do not squander this opportunity. Unfortunately, to do so is to go against his beloved Neo. He weighs which is better and he thinks he is better off with his Neo. For them, he can do no wrong. If only he will accept we are all sinners. Even our Lord Jesus was a sinner as taught by them. So, he shouldn't believe that he could do no wrong. If he will only admit he did Fr. Paul or Msgr James wrong, then he will not squander this opportunity. As Tim said, this is a hero moment for him. Of course, he will squander this again. And when he re-visits this in the near future, when everything has been lost, he will realized, indeed, he squandered this hero moment. 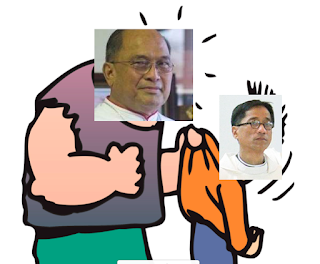 Let us not forget Father Efren. He too is being treated the same. He was a great pastor if Saint Joseph as he sought funding for its restoration. A great spiritual leader now sits on the side bench while NCW Cult Presbyters are selected over these three great men of the cloth as Pastor. I remember serving during Father Efren's ordination in the CB in 1988. Sadly he too is a victim of bully's in the hill all because he stood up for the elderly who are being taken advantage of by the evil NCW Cult. Richard, Richard, Richard...you were stellar in your professionalism and dedication to duty at CB many centuries ago in the midst of sometimes difficult situations! In military parlance you were a "commander's dream." Thank you for a special mention on JW but I have to parry the accolades such as "great" that I neither deserve nor want, when I know that I was just doing my job. I have to clarify that in the case of San Jose Church the plan was already in place to renovate when I stepped in. All I had to do was to implement and coordinate actions with the Guam Preservation Trust and the Parish Council, and to ensure its completion. Andy Laguana and Wayne Reed did most of the work, along with awesome Inarajan folks. Nothing heroic for me there at all. Secondly, you and I know that in military training we do not thrive in victimization but insist on survivalism. In the span of a year of my return to Guam, I have not wallowed in a "poor me" mentality. Far from it, my friend. In fact my assisgnment at FDMS has turned out to be a blessing. I mean, what greater privilege can there be in molding and empowering the minds and hearts of young individuals who are poised to provide leadership in society? Archbishop Apuron has done me a great favor in doing so. These boys are no dummies, and I learn a lot in my interaction with them on a daily basis. Along with their supportive teachers and parents, I revel in the opportunity of providing them the language to articulate their place in the public arena. I am far from being benched in the sidelines. I am a survivor, and it will take more than this to break me. I am good, but saddened by many things that are left unsaid. Having said that, do know that I remain committed to the cause of unity in our disjointed and warped situation in the Archdiocese. Even a casual "Sunday-attendee-in-the-pew" knows that there is division in the local church and that there is urgent need to address reasonable requests for transparency and accountability. I remain convinced in the efforts of lay people to seek clarity and honest answers from leadership. Respected members of CCOG have no malicious agenda except to seek transparency. I have not participated in the ongoing discussion or lack thereof for two reasons: since the investigation by Vatican visitors I entrusted to them the task within their purview rather than to further complicate truth-finding process. I am hopeful that appropriate decisions will be made before the church devolves into unwanted anarchy. Secondly, my position as a priest in the Archdiocese and under the employ of FDMS severely limits the parameters of my freedom to voice out my opinion in public. I am thankful for the sincere efforts of our laypeople to pray for unity and to publicly express their dissatisfaction with current church administration. They are perfectly within their rights to engage in free speech for the purpose of rectifying unsolved issues. We are their servants, and it is their welfare and that of their souls that we are ultimately responsible. I pray that we remain humble and stay mindful of who we are as Church. With urgent and pressing issues that assault our Christian beliefs we cannot afford as a Catholic Church to remain divided but we need to be of one voice and one heart. May the God of Peace through the intercession of Santa Marian Kamalen assist us in time of trouble.